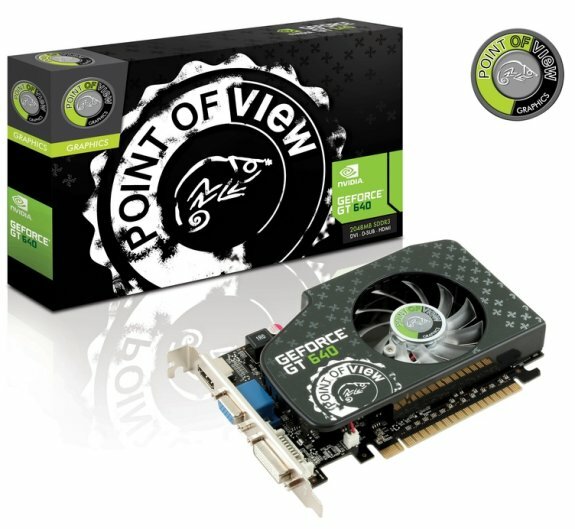 Point of View debuts its GeForce GT 640 graphics card. This model has a 902MHz core, 1803MHz shaders, and 1GB/2GB GDDR3 clocked at 1782MHz (effective). Point of View, a premier NVIDIA graphics partner and manufacturer of Android tablets, notebooks and other hardware, launches today the GeForce 600-series all-rounder card; the POV GeForce® GT 640. GeForce® GT 640 is specifically designed as an energy efficient and cool graphics processor. Developed on a 28nm die-size, the renowned Kepler architecture uses the new SMX steaming multiprocessor technology to not only offer the best performance but also the optimal performance per watt! New features include NVIDIA Adaptive vSync, FXAA Anti-aliasing and a NVIDIA Surround Technology; great feature that allows up to three displays to be connected simultaneously. Furthermore, the graphics card has three graphics outputs, Dual Link DVI, HDMI and VGA. This new GPU architecture works with either 1024 MB or 2048 MB of DDR3 graphics memory and contains 384 shader processors. Enable excellent graphics performance and boost video playback, image quality and application and gaming performance on your PC’s! Compared to previous generation GeForce graphics cards, the GeForce® GT 640 can offer an energy consumption drop up to 30% and compared to an average integrated graphics processor, you can expect a performance increase up to 9x! The GeForce® GT 640 ensures excellent performance for your HD videos and photos, immersive 3D movies, and entry level gaming.